Volleyball officials should be professional and fair. Your demeanor as a referee will be critical to how smooth your matches will play out. The following are guidelines for professional high school volleyball referees. Never be late. Arrive at least 30 minutes prior to the match. If it's not possible to arrive this early, call the schools administration and notify them of the time you will arrive. Never care who wins the match. Never make a call to favor a team for any reason. Good volleyball referees read the rule book often. It's good be up to knowledge about rules especially if refereeing other volleyball levels such as college or USAV. Attend clinics and conferences on volleyball officiating. Keep up with mechanics, rule changes, and the finer points of the game. Dress and act the part. In officiating, the book is judged by its cover. Your appearance before, during, and after the game is important. Conduct the pregame conferences with other volleyball referees, coaches from each team, and players. This is your opportunity to prevent problems by discussing ground rules and other rules volleyball coaches and players may have. Remember, your actions in every match reflect on all officials. A true professional doesn't ever showboat. Any action designed to draw attention away from the players and to the official is unacceptable and unprofessional. "What you permit you promote." Inappropriate behavior by players should be dealt with immediately. The best way to avoid conflict is by keeping your concentration. Don't anticipate the call, anticipate the play. Do be aware of players who follow through with actions after the ball has gone. Don't criticize other officials in volleyball. Let your work and the work of others speak for itself. If other officials ask for your critique, be honest and supportive. The officials jurisdiction ends when they leave the court at the conclusion of the match. Report in writing any disqualifications and unusual incidents to the proper authorities. Leave the gym as quickly as possible to avoid confrontation with players, coaches, and fans. Conduct a self-appraisal of how you conducted the match. Don't beat up on yourself. 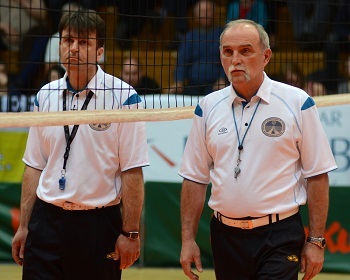 Make the commitment to do what you need to do to be a more professional volleyball official.